Onion domes are usually larger in diameter than the drum upon which they are set, with a height that almost always exceeds their width. The bulging structure of the onion dome tapers to a smooth point and makes for a charming architectural addition. Stromberg is the world’s largest producer of glass fiber reinforced concrete (GFRC) onion domes. They can handle projects of any size and offer a variety of materials, textures and finishes. Stromberg GFRC domes can be used in any kind of weather and have even been used for hurricane shelters and command centers in tornado areas. Stromberg will crate and ship your GFRC onion dome by ocean freight anywhere in the world and provide you with an exact shipping quote. Glass fiber reinforced concrete onion domes are innately strong because of their shape; Stromberg uses high strength materials in their manufacture as well. Stromberg can provide on-site construction and assembly of your GFRC dome. Smaller domes of less than 8-10 feet will arrive at your job-site in one piece; larger ones come in pie-shaped sections that are bolted together. 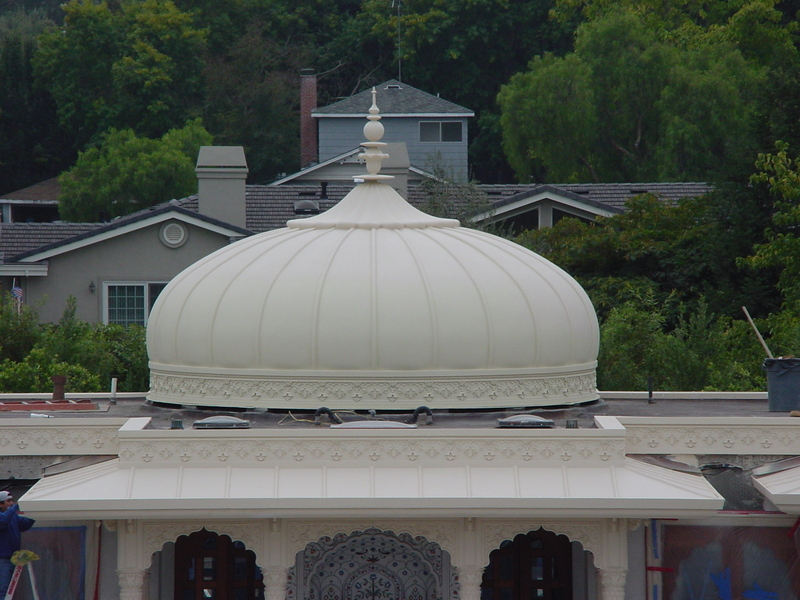 If your GFRC onion dome is for decorative purposes only, the roof is put in place and the onion dome is placed on top. If your onion dome is to be seen only from the interior of your building, Stromberg can suspend it from the ceiling above. Whether your dome is interior or exterior, Stromberg GFRC onion domes are ruggedly built; they can withstand category 5 hurricane winds, are rot and rust resistant. GFRC onion domes will save you maintenance costs and are also earthquake resistant. GFRC is concrete that uses glass fibers for reinforcement instead of steel and is cast in thin sections. Thus, your GFRC onion dome will be tough, lightweight and rustproof; there’s no need for a protective layer of concrete. The glass fiber used in Stromberg’s GFRC onion domes has a higher tensile strength than steel; GFRC can last as long as precast concrete. Both of these qualities make GFRC an excellent choice for your onion dome. GFRC onion domes are available in a variety of materials, textures and finishes. Glass Fiber Reinforced Concrete is strong, durable and environmentally friendly. Stromberg has the world’s largest selection of domes. The professionals at Stromberg Architectural Products will provide you with their expert guidance until your project is completed to your satisfaction. Stromberg will help with CAD design assistance and specifications. Contact them today at (903) 454-0904 for a free custom quote and let their team of experts help you get the job done.